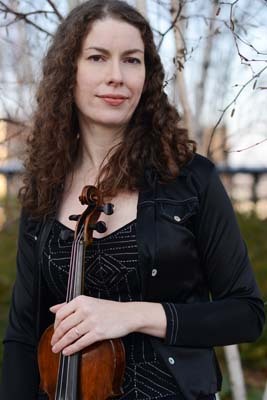 Megan Gould (violin) is one of NYC's most versatile performers of Middle Eastern, Greek and popular music. Since completing a Master's Degree in Ethnomusicology (with a concentration on the Middle East) from the University of London, she has performed around the world in cities as far-flung as Paris, London, Budapest, Copenhagen and Dubai, and has toured extensively throughout the US, appearing at venues including Carnegie Hall, the Kennedy Center, Lincoln Center, and on TV and radio broadcasts for NBC, PBS, MTV and NPR. She has performed onstage with popular artists such as David Byrne, John Mellencamp, Sean Lennon and Donovan, and with jazz notables Fabian Almazan, Wayne Horvitz and Jenny Scheinman. She has worked with numerous renowned world music artists, including Yungchen Lhamo, Giannis Markopoulos, the Naghmeh Ensemble, Alkinis Protopsaltis, and the Silk Road Ensemble. Her work has appeared on many varied recordings and film soundtracks for artists including Lou Reed, Philip Glass, Metallica and Nico Muhly. While taking on a significant amount of freelance work, her ongoing positions include Assistant Music Director of the New York Arabic Orchestra under Lebanese master musician Bassam Saba, a member of Greek 'oud virtuoso Mavrothi Kontanis' Maeandros Ensemble, and the violinist for the singer Monika Jalili's ensemble, and the popular Greek bands Mikrokosmos and Synolon. Currently she resides in the New York City area, where she performs and records with groups ranging from traditional Arabic to rock.